Training: Patty Kasper and her senior clinical research consulting team have brought well-designed training programs to the biopharmaceutical industry since 1995. They are recognized experts in phases 1-4 and have directed clinical trials in the US, Canada, and Europe. They provide hands-on learning experiences with every training session to give you a deeper understanding of the subject. Learn more. Operations: If you are overwhelmed by study startup activities, or urgently need help with study closeout these experts can help you. Learn more. 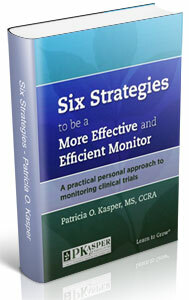 Six Strategies to be a More Effective and Efficient Monitor by Patty Kasper. and start using this book today! Article: "Five Smart Strategies to Develop Your Clinical Research Career," Patty's article in Clinical Researcher magazine. Read now. A referral is the greatest compliment we can receive! P. Kasper & Associates introduces a Referral Reward Program. Fill in our online referral form.